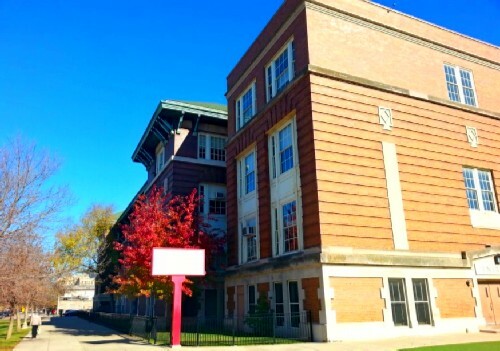 Last July, the Commission on Chicago Landmarks recommended that the former Stewart School building (4525 N Kenmore) be designated as a City of Chicago landmark. Today a proposal to do just that was introduced in the City Council for Stewart, along with the former Peabody School in West Town. Part of the 2015 sale agreement between CPS and Morningside Equities Group specified that Morningside "preserve the building’s unique and historical character" as well as "seek landmark designation from the City’s Commission on Chicago Landmarks." The building was designed by Dwight Perkins just after the turn of the century (we have dates ranging from 1905 to 1908) and is an example of his "radical" notions that schools be surrounded by open space and that they be situated so that the classrooms received plenty of sunlight. First you declare it a Chicago landmark. Then you tear it down. Am I the only one who finds this sort of strange? (I attended Stewart School from 1942 to 1950. Sorry to see it go). It's not being torn down. The landmark protections are in place.